'Green Thumb Mary' is also a professional seamstress with decades of experience. She has a keen eye to style and individual preferences. Ask Mary for any garment and provide your own fabric or choose from her quality, bargain inventory, and voila - it's done. Mary has a great love and commitment to the Grandmothers Campaign and a contributes a real zest and fun to 4Gs. 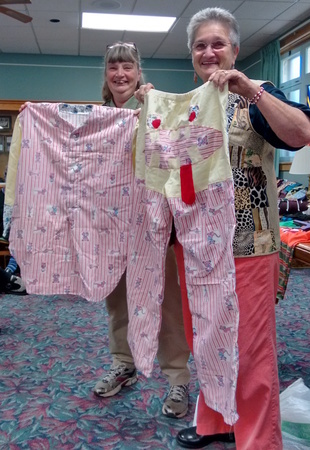 Mary surprised 4Gs member with great pajamas by piecing together leftovers from the four grandchildren pj's. Cosy pjs loved by all. In addition, Mary is a great knitter. Her double mittens were popular items at the 4Gs markets this fall.